I am a visual artist who uses the technique of assemblage to create sulptures using recycled metals and found object. I have scoured the city and countryside for materials that catch my eye. Back in my studio, I combine diverse elements by nailing, gluing, bolting or welding. My early work consisted of whimsical figures made from farm utensils, medical equipment, and musical instruments. I then turned to furniture making, juxtaposing contemporary materials such as glass and stainless steel with machine parts and other salvaged materials. When I acquired old copper roofing and downspouts, I began my venturing into abstract metal collages and mosaics. I am currently using old cabinet doors as my canvases, which I paint and enhance with found objects.These are my ArtDoors. Checkout my ArtDoor Gallery on my website (edgrossart.com) .but a visit to my studio will allow you to see much more of my work, up close and in person. I work out of a large industrial studio at the Crown, Cork and Seal Complex in Baltimore’s Highlandtown that dates back to 1906. There I have my collection of thousands of parts and materials collected over the years. My wife Linda shares the studio and works in a variety of media. We have a gallery displaying our work. In 2014 I was the winner of the Seemes G. Walsh Award from the Baker Foundation in Baltimore and my work was exhibited along with other Baker award winners at the Baltimore Museum of Art. . I am a very lucky person as I approach my 80th year. I had a most wonderful career as a meteorologist with the National Weather Service. And, in 2001, I was honored to be elected a fellow of the American Meteorological Society. Highlight Event in my art life. As many of you know I was a meteorologist for fifty years (yup…50) and have been creating my art for around 25 years. My mantra or whatever you call it is: “Once I was a meteorologist who did art and now I am an artist who did meteorology”. I still love meteorology and the many friends that I met through the years. But, today art is my passion and I work daily at my studio at the 1906 Crown, Cork and Seal Complex in Highlandtown, Maryland. I have a large studio and gallery . My wife Linda also works in the studio on a variety of media: painting, painted boxes, jewelry , and clay. Highlandtown is one of Baltimore’s three arts districts, along with Station North and the Bromo districts. Besides the Creative Alliance, there are more than 100 working artists in Highlandtown. 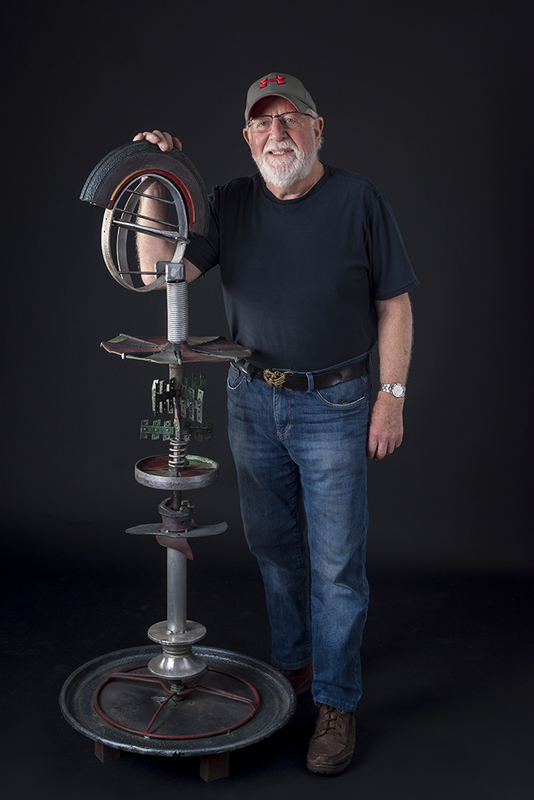 The late Leonard Cave, a multitalented artist who introduced me to found object art and to my first scrap iron yard (Montgomery Scrap Iron) in Gaithersburg, Maryland. The later Roy Loun whose family has operated a scrap iron repository for over 100 years. Roy would point me in the direction of some turn of the century farm equipment and I dug then up and Roy explained what they were used for. Not too many guys from the Bronx ever saw a farm equipment, let aside a cow. He set aside old wheels and other things for me as I went to Kemptown, Maryland regularly during my major artifact hunts. Mike Patton– An artist and teacher who took me into his studio at 302 S. Central along with my ton of metal and sculptures when we moved to Bmore in 2001. He has been a good friend and mentor. George Murrell – An artist whom I shared a studio with for over a decade. After watching that debate the other night (I forced myself) it made me think about how George and I collaborated. When I came into the studio he lowered Rush Limbaugh and I did the same with NPR …. détente. And, we never talked politics. Watching George work through the years helped me in my learning process. Felicia Zannino- Baker– Felicia owns the “Highlandtown Gallery” and was the first place that I showed my work in Highlandtown. She helped open many doors. Scott Buckholder – On that line Scott was standing behind me and was impressed that an old man like me could use an iPhone. After introductions we began to talk about everything from the art scene in Baltimore and many other activities that was of interested me. He even told me to put in for a Baker Award and introduced me to many other people who helped me along the way. He and his wife Jenn have become our closest friends. Brooke and Justin Allen- Scott introduced me to Brooke and Justine when they were starting WhatWeekly and they created my fab website and introduced me to other artists and friends in the area. Jeff Martin– Photographer and friend runs the Skyloft Gallery in Highlandtown where I exhibit my work. There are many others that also helped along the way. Collaboration became an important aspect of my art education as I have had the opportunity to work with some talented artist in the area. Michael Owen -He is a wonderful artist and muralist, best know for the Baltimore Love Project He and I collaborated over the past winter on three very cool pieces. I have learned a great deal watching Michael work and talking with him. Michael Metcalf- A visionary artist and man of many skills, who built the gallery in my studio. We talk about art and interesting projects ahead. Chad Omweg– Chad makes very cool furniture and has done some welding for me. He has a studio around the corner from mine and he has not only helped me but has taught me a great deal about welding and other things related to my work and skill levels. Jill Orloff- Besides being a former first class architect, Jill creates some amazing functional art using found objects and her great imagination. My path to being a full time artist has been unusual. Long before I was a working artist I was a meteorologist focusing on a wide range of environmental issues throughout my career. I have been working on my art now well over two decades. In 2007, I retired after 50 years of work and have been focusing all my time today as that working artist and have transformed my path from scientist to artist. My early works were whimsical assemblages using the vast array of found objects I had been collecting through the years. In my latest phase I am creating more Functional Art as well as a large series of what I call 3D Metal Collages and RoofTop Views, utilizing patinaed, painted copper, rusted corrugated metal and other items I have around my studio. Being self taught with no formal training, my work has been exhibited at numerous shows and exhibits in the Washington, DC/Baltimore area over the last 20 years. Here is part of an article written by Justin Allen of WhatWeekly.com. I feel that it captures who I am today. “After taking part in the creation of something as successful and integral to the everyday lives of millions of people as the Weather Channel, many baby boomers would have called it quits, stashed their loot, and escaped to a gated community someplace sunny. But if you knew Ed Gross you’d know that he’s nowhere near that predictable and such a fate simply wouldn’t suffice. 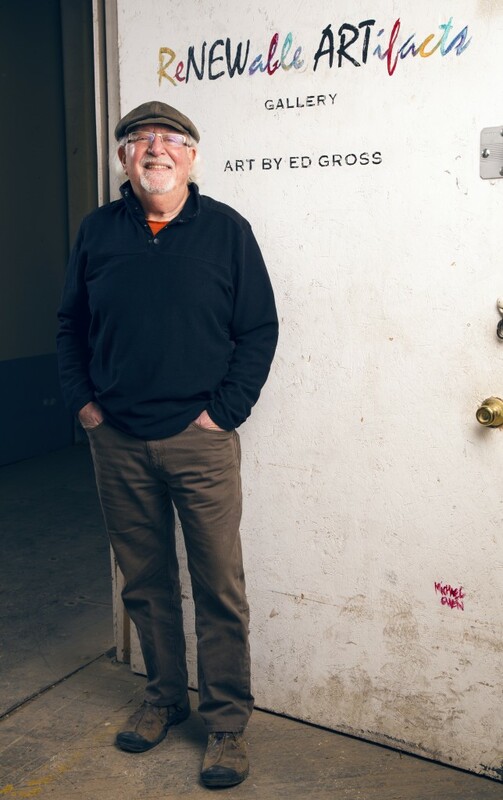 Ed Gross: Act II casts this retired meteorologist in the role of a bohemian romantic, a struggling artist who hopes to help save the world from itself by creating art only from materials he can manage to salvage. That’s right folks; the art produced by Ed Gross isn’t only pleasing to the eye, stimulation for one’s intellect and, at times, functional. It’s created responsibly using sustainable practices. Leave it to a meteorologist to create art without increasing his carbon foot print”. Over the past decade, I have begun a new phase in my work by creating more furniture as well as a large series of 3D metal collages. In my furniture series, I am creating cocktail and other tables using oak from an old German log cabin built in Indiana during the 1850’s, and old copper from our friends Yellow Barn Farm in Zelienople, PA .Old patinaed gutters and downspouts come from an upper Baltimore County house and the local junk yards that let me explore, provide some of the other findings for my work. It is really exciting to find these treasures with all their natural color and beauty and to be able to integrate them into new works of art. In the early 1990’s when I first started to work as an artist, my focus was on creating sculptures. The timeworn quality of the old farm implements that I have been collecting helped form the vision for my work. I first started working with farm equipment that was fashioned years ago of hand-wrought metals and are very sculptural in themselves. I tried to preserve the integrity of these artifacts while assembling them into forms that appeal to me. I also discovered great sources of steel, aluminum, copper and other metals during my treasure hunts. In searching for a way to show off the beauty of these artifacts, I found that juxtaposing these well-used parts with the textures and intricacies of modern day machine parts along with wood and other materials, allowed me to create something entirely new: a work of art that enhances the complexities of each. The interaction of the new and old creates an intensity that is not found in one alone. As I go beyond the forms themselves, I often add color to enhance the texture and depth of the piece. In many cases, the work that I create take on lives of their own, developing a personality and character that often sets a mood that seems to speak to viewers in various ways. As I continue my search through junk yards, (the goldmines for the objects that become my art) I am also captivated by what lies beneath the rust and grime. The stories that accompany these parts are often as intriguing as the parts themselves. I try to convey something of their stories in my sculptures. I have also collaborated with other artists, which is a great way to learn from others. The first three collaborative pieces I have done with Michael Owen, a contemporary painter whose work is found across galleries as well as the streets of the United States. Michael is also the creator and lead artist of the Baltimore Love Project. And, if you are ever in the Baltimore area, please visit my studio, located in the Old Crown Cork and Seal Complex. It’s pretty cool. My studio is in the Highland area of Baltimore, MD. You can reach me at emg144@comcast.net or by phone at 301-509-1171. Directions can be found in the contact section.